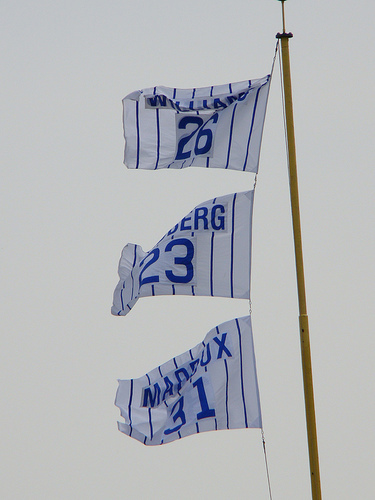 The Cubs retire the number of one of the all-time greats: Good Ol’ Number 26, Billy Williams. It is only the second number they ever retired (Ernie was first). Maybe there is some magic in the air, because the woeful Cubs come back to win the game in dramatic fashion. Catcher Jody Davis knocks in two runs with a bases loaded single in the bottom of the eighth…Just as Billy had done many times during his Cubs career. 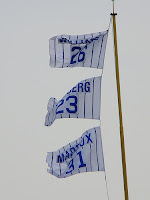 Billy’s #26 now shares a flagpole with #23 (Ryne Sandberg), and #31 (Greg Maddux). August 13: In 1967, the Cubs win the first game of a double-header against the Phillies thanks to their part-time pitcher Ken Holtzman. He’s in the National Guard and only allowed to pitch on weekends. He won’t lose a game all year (9-0). August 14: In 1959, Dale Long hits a game winning pinch hit home run for the second day in a row. This one comes off ex-Cub Sam “Toothpick” Jones in a 7-5 win over the Giants. August 15: On this day in 1964, the Cubs stage Ernie Banks Day at Wrigley Field. 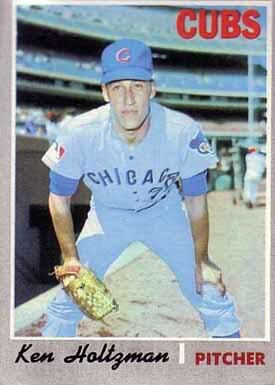 Ernie is in his tenth season with the Cubs. The day ends the same way most of his days ended in this era, with a Cubs loss. Bob Bailey hits a homer in the ninth against Lindy McDaniel to win it for the Pirates, 5-4. Ernie goes 0 for 3, and scores a run…In 2002, Mark Prior strikes out seven batters in a row, and 12 overall in a 6-4 win over Houston. August 16: In 1932, during a pennant winning season, the Cubs stage a dramatic comeback, scoring four runs in the bottom of the ninth to win the game 4-3. Billy Jurges, just back from a gunshot wound, drives in a run, followed by RBI singles from Woody English, Kiki Cuyler, and Riggs Stephenson…In 1992, Greg Maddux throws a shutout, and the Cubs win the game 1-0 versus the Astros. August 17: On this day in 1916, Hippo Vaughn throws one of his many gems in the Cubs’ first season at Weegham Park, a 1-0 shutout against the New York Giants. Recently acquired Fritz Mollwitz knocks in the game’s only run. Mollwitz was born in Germany and will face taunts from the crowds after America enters World War I the following season…In 1926, Guy Bush throws a two-hitter to beat the Giants 7-0. Both hits come from future Hall of Famers—Freddie Lindstrom and Mel Ott…In 1960, Ernie Banks hits a walk-off homer in the ninth against Don Drysdale to win the game 1-0. Glen Hobbie gets the win. August 18: On this day in 1934, Pat Malone pitches a two-hitter to defeat the Phillies 2-0. Riggs Stephenson gets the game winning hit…In 1946, Paul Erickson pitches a one-hitter against the Pirates, and the Cubs win 8-0. Rookie shortstop Billy Cox gets Pittburgh’s only hit…In 1952, Cubs player/manager Phil Cavarretta calls his own name to pinch hit in the bottom of the ninth and hits a 2-run walk-off homer against the Pirates. Ken Holtzman throws a no-hitter against an Atlanta Braves team that is loaded with big bats (including Hank Aaron, Orlando Cepeda, and Rico Carty). It’s a most unusual no-hitter in several different ways. In the first place, he manages to do it without striking out a single batter. Secondly, his catcher that day Bill Heath, is hit by a foul tip and breaks his hand. Gene Oliver finishes the game at catcher, and Heath never plays in the majors again. And finally, somehow, this no-hitter marks the beginning of the end of the 1969 Cubs. After the no-hitter, the Cubs are in first place, 7 1/2 games ahead of the second place Mets. They go 15-26 the rest of the way while the Mets go on one of the hottest streaks in baseball history. That 7 1/2 game lead on August 19th turns into an 8 game deficit on the final day of the 1969 season.